The great mystery: why we obey the state. States are more vulnerable than people think. They can collapse in an instant—when consent is withdrawn. This is the thesis of this thrilling book. Murray Rothbard writes a classic introduction to one of the great political essays in the history of ideas. In times when dictators the world over are falling from pressure from their own people, this book, written nearly 500 years ago, is truly the prophetic tract of our times. La Boétie goes on to make a case as to why people ought to withdraw their consent immediately. He urges all people to rise up and cast off tyranny simply by refusing to concede that the state is in charge. The tyrant has "nothing more than the power that you confer upon him to destroy you. Where has he acquired enough eyes to spy upon you, if you do not provide them yourselves? How can he have so many arms to beat you with, if he does not borrow them from you? The feet that trample down your cities, where does he get them if they are not your own? How does he have any power over you except through you? How would he dare assail you if he had no cooperation from you?" Then these inspiring words: "Resolve to serve no more, and you are at once freed. I do not ask that you place hands upon the tyrant to topple him over, but simply that you support him no longer; then you will behold him, like a great Colossus whose pedestal has been pulled away, fall of his own weight and break in pieces." In all these areas, the author has anticipated Jefferson and Arendt, Gandhi and Spooner, and those who overthrew Soviet tyranny. The essay has profound relevance for understanding history and all our times. As Rothbard writes in his spectacular introduction, "La Boetie's Discourse has a vital importance for the modern reader—an importance that goes beyond the sheer pleasure of reading a great and seminal work on political philosophy, or, for the libertarian, of reading the first libertarian political philosopher in the Western world. For La Boétie speaks most sharply to the problem which all libertarians—indeed, all opponents of despotism—find particularly difficult: the problem of strategy. Facing the devastating and seemingly overwhelming power of the modern State, how can a free and very different world be brought about? How in the world can we get from here to there, from a world of tyranny to a world of freedom? 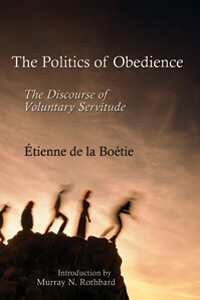 Precisely because of his abstract and timeless methodology, La Boétie offers vital insights into this eternal problem." This is one of the most important tracts in the history political thought. The ideas expressed in here can be seen in later influential figures: Thoreau, Gandhi, and King. This book is mandatory reading, not just for libertarians, but for anyone interested in political theory. I would liked to have seen, though, Bonnefon's introduction as well as Rothbard's. This would have given a nice balance between the two. But the price and cool cover make up for it. Although it tends to ramble on at points and loses the thread of the conversation, which the author himself admits to doing, it doesn't detract a single bit from the indisputable brilliance of the treatise. The "secret" to freedom is found in these very pages, my friends. For the price, you cannot beat this little gem of a book. Murray Rothbard's introduction is worth the price itself. It's a short and concise read that is packed full of insight. I had several "Aha!" moments while reading this one.